Op/Ed: Touchdown Pass or Lost Yardage—What Will It Be AEG? As places celebrating athletic discipline and active lives, professional sports stadiums should energize physical activity and empower health. Unfortunately, the sports-entertainment giant Anshutz Entertainment Group’s (AEG)proposal for a football stadium and new Convention Center in downtown Los Angeles will hurt surrounding communities. The proposed stadium will permanently change the landscape–and harm the health–of downtown Los Angeles. As physicians, we know our patients’ health is shaped more by where and how they live than by what pills they take. The residents near the proposed development already suffer from hypertension, diabetes and obesity at substantially higher rates than in other parts of the City and County. In response to worries about the potential negative impacts of this project, community groups worked with local residents and a reputed consulting firm, Human Impact Partners, to conduct a Health Impact Assessment (HIA) of AEG’s proposed Farmers’ Field downtown development. The study reveals that the Farmers Field project has the very real potential to increase air and noise pollution, to unfairly displace low income residents, and to pose public safety threats to long term residents of the communities of South Park, Pico Union and Central City areas of downtown. Fortunately, the assessment contains community and evidence-based recommendations to reduce these threats to health. AEG promised the world that Farmer’s Field will be “the most environmentally responsible sports and entertainment district in the world.” Thus far, those promises appear empty, including a promise that the stadium will be carbon-neutral and that between 18.5 and 27 percent of patrons would arrive on transit, foot or bike. Unfortunately, the Draft Environmental Impact Report (DEIR) prepared by AEG and required under state law does not cite any local examples of active transportation shares anywhere near this ratio: Rose Bowl’s share is 5% and Dodger Stadium’s is approximately 2%. The DEIR does not analyze the use of transit to STAPLES Center, which is immediately adjacent to the proposed stadium. Further, many of the mitigation measures described in the DEIR are inadequate, unenforceable, or improperly deferred until after the close of the environmental review process. When we plan developments around just automobiles, we are casting bad health policy in permanent concrete. Los Angelenos deserve to see clear, specific plans for how AEG intends to significantly increase public transit ridership and decrease car trips. These measures are required by the California Environmental Quality Act and by the state legislature under SB 292. AEG could look to the Pac Bell Stadium in San Francisco as a successful model for increasing rates of active transportation. In response to local residents’ and businesses’ concerns about traffic and parking, San Francisco required the development and approval of a Transportation Management Plan. The plan included the construction and promotion of existing and new transit services and an ambitious marketing campaign called “Your Ticket Home,” which provided incentives to utilize transit and walking. San Francisco is rightly proud of Pac Bell Stadium; it is frequently sold out. It has 40,800 seats, with only 5,000 parking spaces. With 50 percent of fans arriving a block from the stadium via light rail and a regional commuter train, the parking lots are rarely full to capacity. Doesn’t Los Angeles also deserve the benefits of excellent transit access to our sports stadium? AEG must commit to measures that make taking public transit to stadium events easy, safe and affordable. With this investment in a new Convention Center and downtown stadium, the City has a chance to make a long overdue pass and score a touchdown that benefits the health and livelihood of all Angelenos. But the current plans for Farmers Field will lead to lost yardage when it comes to our city’s health and a future of dreary, congested asphalt. 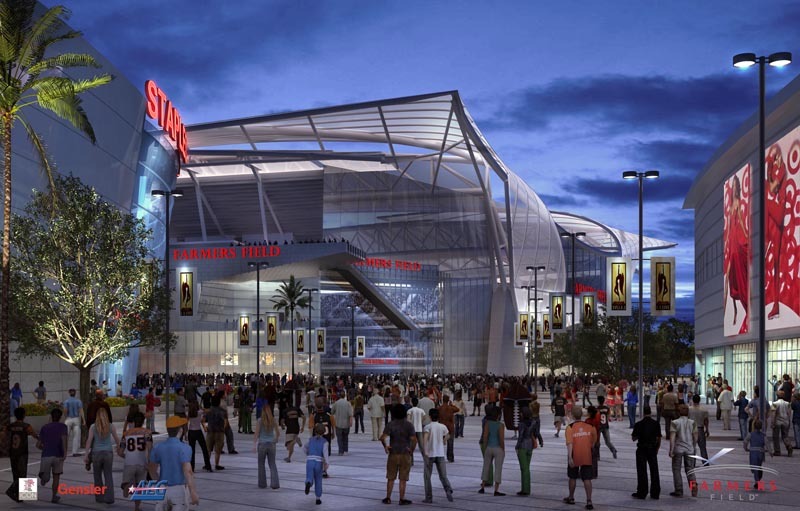 If AEG takes steps to reduce the number of car trips to events, limit air pollution, and preserve affordable housing, the new stadium will encourage physical activity and healthy lifestyles in the surrounding neighborhoods and for all event patrons. A compact stadium design with space for parks, community gardens and farmers’ markets could truly integrate the new development into an active neighborhood. AEG should give Los Angeles a Stadium and a public asset that all Los Angelenos can be proud of, especially the local residents. Los Angeles fans deserve a winning team, the greenest stadium possible, and a truly healthy and vibrant community. Richard Jackson is Professor and Chair of the Department of Environmental Health Sciences at UCLA and recent host of the PBS series, Designing Healthy Communities. He is also a Board Member of Physicians for Social Responsibility-Los Angeles. Rishi Manchanda is the founder of HealthBegins, an Assistant Professor at Charles R Drew University of Medicine and Science, and was formerly the Director of Social Medicine and Health Equity at St Johns Well Child and Family Centers. Or we can sidestep all of these environmental justice concerns altogether and support the LA Stadium proposal in Industry. The Industry stadium, being in an industrial area, LEED certified, with convenient Metrolink access (on site station included) and enough parking spaces to accommodate charter buses and tailgaters (instead of unknown off site tailgating locations in random neighborhoods around the AEG proposal), and with approved environmental impact reports, is ready to go as the environmentally superior alternative. There are no affordable housing concerns as the Industry stadium will not create gentrification. Parks and farmers markets will be displaced by the thousands of people a stadium would attract, not be enhanced by them. The freeway system in the San Gabriel Valley is free flowing most of the day and on weekends, unlike that of Downtown LA, and more fans who live in Orange County and the Inland Empire (the population centroid of the LA/IE metro region is actually in Hacienda Heights). There are less domino effects such as would happen when the Dodgers and the proposed football team might play simultaneously. There are multiple ways in and out of this stadium that don’t go through residential communities. The best way to create vibrant communities is not to introduce thousands of people passing through them on busy surface streets, preventing those who want to go to the communities for non-game related reasons from doing so. Industry lets football fans have a much better experience, while leaving the rest of us who want to enjoy Downtown, Hollywood, and the Westside alone. Couple of issues with this. First, the Industry Stadium does not have an approved EIR. If I recall correctly, Arnold signed off on allowing them exemption from the normal approval process, hoping to fast track the return of the NFL to the LA area. The Downtown proposal has it’s flaws, but so does the Industry one. You’re acting as if building it out in Industry will affect no one. There are tons of single family homes in Diamond Bar/Walnut. They live directly adjacent to the proposed site. Those residents don’t want the stadium there for the exact same reasons as the concerned residents downtown. tailgating indicates that they haven’t considered it in the slightest. Traffic will be a problem in either location, let’s not kid ourselves here. The 60 and the 57 aren’t especially large freeways, and they merge into a single freeway in the stretch directly adjacent to the proposed Grand Crossing site. That stretch would be guaranteed to create problems on game days. Majestic’s claim that their location is more centrally located based on population distribution may be true. But that also hurts their chances at courting fans from the SF Valley and West LA markets, who would be looking at anywhere from an 80 – 120 mile round trip just to see a football game. That’s going to be a deal breaker. Is it really worth inconveniencing the western and northern reaches of LA county just to court fans from Riverside and San Bernadino? The Industry Stadium EIR was certified by the City of Industry, the Lead Agency for the project. Walnut, Diamond Bar, and some NIMBYs sued. The city councils of Walnut and Diamond Bar settled, and mediation was entered into with the NIMBY group. However, because the mediation failed, the stadium legislation was introduced giving the Industry stadium a statutory exemption to the project. That does not mean that the project was not approved, as Industry had jurisdiction over the project as the responsible municipal government. While there are many homeowners near the project, there are no environmental justice issues unlike with the downtown stadium. The people in Pico Union will have to deal with more traffic, more loss of street parking, and more spillover effects. There will be no direct access from the Industry stadium to homes in Walnut and Diamond Bar, not without crossing arterial roads and large commercial areas. Apartment buildings and kids playing in the street are just underneath a freeway for the downtown stadium. Roski has paid a lot of attention to transit – indeed, one of the conditions to one of the settlements was an on site Metrolink station for the Industry stadium. The Metrolink station is mentioned several times on the LA Stadium web site. This is comparable access to Gillette Stadium or the Meadowlands. There are more people, and more football fans, in Orange County and the Inland Empire than in the San Fernando Valley. And people in the San Fernando Valley and West LA could take Metrolink, or charter buses to the game. The difference is that Downtown is centrally located on the freeway network, creating a traffic bottleneck for the whole region. The 405 is hardly an alternative route. Meanwhile, there are north south freeways like the 605 and 15, and east west freeways like the 210, 10, and 91 which avoid Grand Crossing altogether. L.A. Live, Pinnacle of Modern Design, or Bad Urbanism? AEG’s Transpo. Plan, Early Returns Good, but the Devil Remains in the Details.